Pink Lemonade: Swaddling Your Baby? 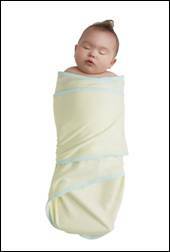 FACT: Medical research showing the incredible efficacy of PROPER swaddling has been done using a snugly-wrapped blanket with arms comfortably immobilized; usually at the sides. Wearable blankets are not snug to apply pressure and do not keep the arms snugly inside.